The embedded form - as its name implies - is embedded into a webpage. This means that it doesn't open from the SalesAutopilot server, but you have to build it into your webpage. How can I get the form's source code? In order to embed a form into your webpage, you will need the form's source code. There are several ways to get the form's source code. At the last step of the form wizard there is a textarea with the HTML source code as you can see below. Select the whole source code and copy it to the clipboard. At the bottom of this screen your e-mail address appear in an input field. You can modify it to an arbitrary e-mail address. When you click on to the "Next" button SalesAutopilot automatically sends the source code of the form by e-mail to the given e-mail address. If you already created the form click on the form name in the left menu and then click the "Upload form" tab. Select the source code in the textarea and copy it to the clipboard by pressing CTRL + C.
You can also send the HTML source to your e-mail address. Click the "Embed form" tab. On the following screen you can see your e-mail address. You can modify it to an arbitrary e-mail address. Press the "Send source" button and SalesAutopilot will send the HTML source code of the form to the given e-mail address. Download the attached file from your e-mail account to your computer. Open the source code of the webpage into which you want to embed the form. You can use an HTML editor (pl. Dreamweaver, EditPlus, Notepad++, 1stPage, etc.) or if you are an HTML expert you can use any text editor. 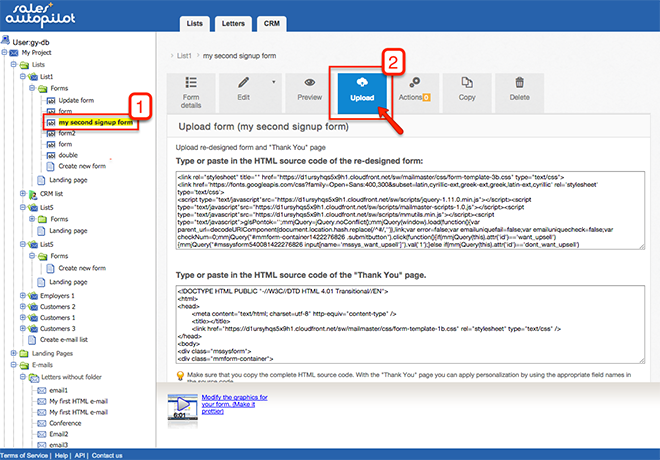 Copy the entire source code of the form into the webpage HTML source where you want to place the form. The form source code is constructed in a way that it doesn't affect the appearance of other elements in your webpage. If you modify the appearance of the form you have to be careful not to change the form's input elements and its attributes. These elements are the following: <form>, <input> <checkbox> <textarea> ,and <script> and their parameters, such as "name", "action" etc. If you want to change the appearance of the form completely remove the CSS meta tags of the form from the source. That way you can adjust every element of the form to match your webpage. However, you need to be an HTML/CSS expert to change the form's appearance completely. You can use the form as a standalone page if you've chosen this setting in the form wizard. In that case the form will open from our webserver. Place a link on your webpage that points to the form. You can find the link URL at the bottom of the form review page. Of course you can place the source code of the form on your webserver too. 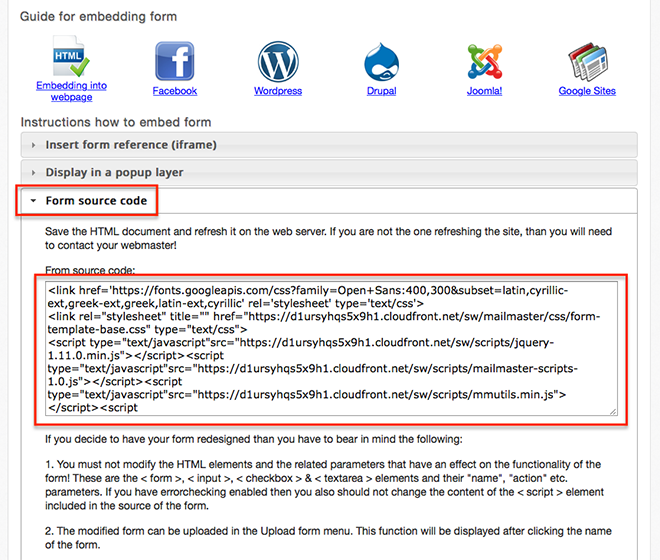 Getting the form's source code is the same as we described above with the embedded form. If you want the form to open from our webserver but you want to change the appearance of the form, click on the "Upload form" tab. Copy the source code of the form into your HTML editor, modify it then copy it back to the same text area. If you want, you can change the confirm page the same way. When you finished click the "Next" button at the bottom of the page. The modified version of the form will appear now. In some cases you have to delete browser cache to see the changes. How can I be notified of new subscribers?